Belgian prosecutors said Friday that three people had been detained in a counterterrorism operation in Brussels prompted by the arrest the day before of a Frenchman in Paris suspected of plotting a new attack. Prosecutors confirmed in a statement that Friday’s arrests were conducted in three districts of the capital — Schaerbeek, Forest and Saint-Gilles. Two of the three suspects suffered leg wounds. Prosecutors also said investigators had used DNA tests to determine that Naijm Laachraoui was one of the suicide bombers who blew himself up in the Brussels airport on Tuesday. Laachraoui was also linked to the November 13 Paris attacks in which 130 people died. His DNA was found on a suicide vest and a piece of cloth discovered at the Bataclan concert hall where 90 people were killed. "We will not be deterred. We will come back with greater resolve, with greater strength, and we will not rest until we have eliminated your nihilistic beliefs and cowardice from the face of the Earth." Police guard a check point during a police raid in the suburb of Schaerbeek in Brussels, March, 24, 2016. 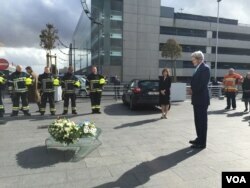 Speaking with VOA and other reporters in Brussels, Kerry declined to blame the Belgian government for not thwarting the attacks, saying, "carping" afterward was "inappropriate." He said the U.S. and Belgium had already scheduled a number of counterterrorism training sessions. The three blasts touched off Tuesday in Brussels killed 31 people and injured about 300. A senior U.S. official confirmed that two Americans were among the dead. U.S. officials have told reporters that the brothers who carried out the attacks, Ibrahim and Khalid El Bakraoui, were on a terrorism watch list in the United States. 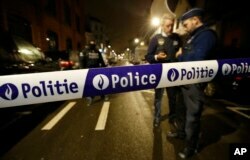 Belgian federal prosecutors said six people had been detained for possible links to the attacks. Police and other emergency workers stand in front of the damaged Zaventem Airport terminal in Brussels on March 23, 2016. Meeting Thursday near one of the attack sites, European Union justice and interior ministers pledged to deepen joint intelligence gathering and swiftly push through measures to share airline passenger information and step up the fight against terrorism. “We don’t need new plans; we need to fully implement the plans and measures that have been taken,” said Interior Minister Ronald Plasterk of the Netherlands, which currently holds the European Union’s rotating presidency. 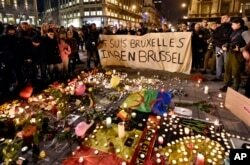 People holding a banner reading "I am Brussels" behind flowers and candles to mourn for the victims at Place de la Bourse in the center of Brussels, March 22, 2016. 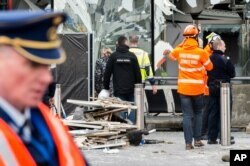 The emergency meeting offered a stark counterpart to the EU’s usually staid gatherings, especially since it took place near the Maalbeek metro station, one of the targets of the attacks. "Everybody feels the attack on Belgium was an attack on Europe and the values we stand for together," Plasterk said. "Europe has been under attack before, but we’ve always defended liberty and democracy and we will do that together."